It would be warranted to give here a brief statement apropos the history of the lute in Ukraine as well the as some general history of the lute. The most common Ukrainian LUTE for which there is considerable ICONOGRAPHY in existence is KOBZA. The Kobza is a gut-strung instrument with medium-length neck, usually (but not necessarity) with frets. It is played with fingertips, both melodically and chordally. It is not to be confused with MODERN BANDURA, a WIRE-strung instrument belonging to the family of harps, zithers, psalteries, guslis and kanteles, which was not in existence until early nineteenth century. Although the nomenclature is extremely confusing it would be important to stress that the name BANDURA/PANDURA unequivocally was used to describe KOBZA before 1800 (see Stählin and other relevant passages on nomenclature). For clarity's sake this article would use word Kobza as standard for the instrument in question and the frame of our reference. The Kobza is also not to be confused with Romanian Cobza, a wire-strung instrument of crude construction, with a very short neck, played with a plectrum, in melodic figuration. KOBZA is of uncertain origin, evolving from some form of KOB-UZ/KOMUZ, most likely spread by invading Turkic POLOVETSIANS that still survive in Ukraine, Moldavia and Valachia as GAGAUZ, or even earlier, during the BULGARIANS' migration from upper Volga to their current home in the Balkans during the 6th-7th centuries (testimony of Ibd-Fadlan, an arab diplomat at the Bulgar capital mentiones idan and tanbirin, i.e. lutelike instruments...). However it developed very differently from either the KOB-UZ or another relative: the Moldavian-Valachian COBZA, both of which have extremely short, unfretted necks. 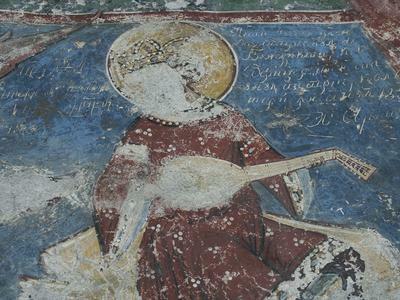 There is an important piece of iconography that predates Polovetsian invasions, an XI-th century fresco at St. Sophia in Kiev , which would suggest that some type of a LUTE was played in Kievan Rus' before word "KOBZA" was attached to it. "The name "kobza", "koboz", "kobuz", etc. could be traced back to 1250 (in both slavic and non-slavic documents), therefore its origins should be associated with even more ancient times". (O. Famintsyn). Semantic surveys prove the existence of similar instruments among other nations: "kobyz" - Tartar, "kopuz" - Turks, "kopus" - Croats, "koboz" - Hungarians, "cobza" - Romanians, etc. Thus, locating the origins of protokobza exclusively on the ancient Ukrainian territories is unjustified, even it there's no doubt that these were the lands where it had formed its familiar characteristics. PANDOURA/CYTHARA was a long necked lute of the Ancient Mediterranean world. There are several theories of its name's origin, which are mostly based on the results of semantic surveys: "pandura" - Assyria, "bandora" - England, "bandurria" - Spain, "panduri" - Georgia, "pandzura" - Bulgaria, "pandura/tambura" - Serbia. It is necessary to mention that the origin of the name may have little to do with the actual origin of an instrument. For instance, English bandora and Ukrainian bandura, except for their names, had nothing to do with each other. However, the English namesake actually does have some bearing on the Ukrainian matter. "The Poles have learned the names for the instruments from numerous Italian musicians, who, since early 16th century, were included into Royal Choirs". (O. Famintsyn). These Italians [mostly from converted Jewish musical families from Veneto (Bassano, Ferrabosco, Lupo inter alia)] were responsible for the spread of the term north to England and east to Poland during Renaissance. This suggests that the lute entered Europe via the Eastern European route rather than with the Moorish conquest of Spain. This would merit a separate discussion and it is this writer's opinion that Lute's entry into Europe occured not in one but in at least three places, the most prominent being Balkan Walachia, home to many type of Lutes, Kobzas and other instruments of similar character. Many German lute sources contain "Walachian" material which until recently was assumed to have referred exclusively to Italian (this is no longer the case...). 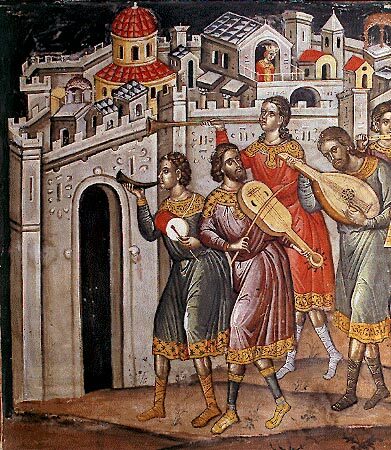 Some of the earliest Lute Iconography occurs in the Byzantine realm (as early as 6th century) and obviously predates all muslim conquests. 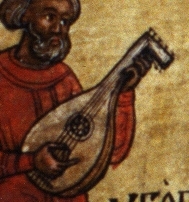 The earliest Lutes were common across Ancient World from Iberia in the West [Spain] to Iberia in the East [Georgia]. These Lutes were of Indo-European origin and were called Tanburs by the Armenians and Persians, and Pandouras by the Greeks. They were rather long-necked and small-bodied and resembled Turkish Saz. The first evidence of a short-necked lute is found in the 6th century floor mosaic of the Imperial Palace in Constantinople, about the same time as the first appearance of Bulgars at the Byzantine borders. This evidence becomes plentiful after the mass exodus of Armenians from Anatolia to Walachia, Moldavia and Bukovina, after Cilician kingdom was overrun by the Seljuks in the 11th century. 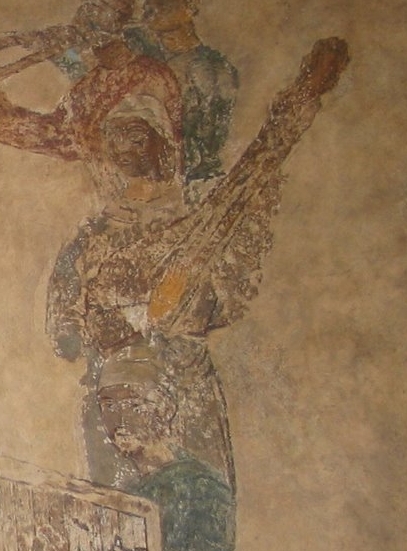 The history of the "kobza" could be traced back to 6th century Byzantine Greek chronicles by Theophilactes that mention Bulgars (an originally Turkic people than now speak a Slavic language) captured in battle that carried CITHARAE, and it was mentioned (as AL'UD) by wandering Arab scholar Ibn-Fadlan who visited Kyevan-Rus (or more likely Volgan Bulgaria) in the 10-11th centuries. Again: the word "KOBZA" is Turkic and was introduced into the Ancient Slavonic language either during the Mongol conquests in the 13th century or earlier, during some absorbtion of Bulgarians or Polovetsians. It is not known by what name a lute might have been known or called previously, as there are few, if any, surviving documents from before 1200. "They have various musical instruments, such as lutes/kobzas, huslis, and dudkas; the dudkas are about two elbows long, while a kobza has eight strings. Their drink is prepared from honey..."
The kobza-bandura eventually became a favorite instrument of the Ukrainian kozaks and was widely played by the rural masses and in the courts of Polish kings and Russian tsars, where it served a role similar to the lute in Western Europe. Unfortunately, the kobza, like its cousin the lute, fell into gradual disuse after 1850, and was sadly replaced by the unfrettable modern bandura, guitar, and mandolin. Eventually modern unfrettable bandura even appropriated the term 'kobza' in vernacular usage. K. J. Hildebrandt, a member of the Swedish delegation to Hetman Bohdan Khmelnytsky that visited Ukraine in 1656-1657, describes in great detail his arrival in Chyghyryn and his welcome by the Hetman. During the informal part of the meeting the Hetman picks up a "lute" and plays. Adam Olearius, a Dane, also mentions some type of a "lute" among the Ukrainians in the 17th century. "In Polish dictionaries and descriptions of instruments bandura is explained as the kozak's lute. (O. Famintsyn). Most of the evidence (Bergholz, Stählin, Ballermann, etc.) spoke of 18th century Bandura as of "an instrument, similar to the lute, but smaller in size and the number of strings", "only the neck is a little shorter", "tone is absolutely similar to the tone of lute". Therefore, they were all speaking about a "kozak lute" - kobza. But along with the such there existed "Real Banduras with 24 and more strings, these don't have all their strings along the neck, half goes across the deck". (O. Famintsyn). These were most likely to be the first Torbans. Several facts could be mentioned apropos the influence of Kobza-Bandura on the development of modern unfrettable bandura: a) even in the 19th century most of banduras were symmetric, which is typical for all lute-like instruments; b) the "harped" strings on bandura's deck are called "prystrunky/by-strings", a clear inference of secondary importance; c) some functional names of kobza strings later have casually transferred to the ones on bandura; d) similar traditional repertoire and performance styles with both "kobzars" and "bandurists"; e) inconvenience of unfrettable bandura when performing "in the ballad manner", compared to absolute ease to do so on a kobza, etc. It is a matter of considerable importance that kobza (partially) shares its tuning with the "Russian" 7 or 11-string guitar (see Chapter IV). 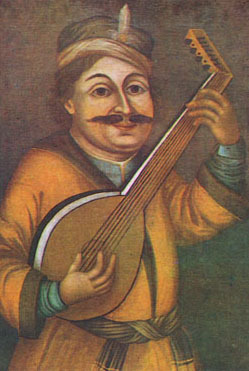 The Ukrainian KOBZA, as depicted in the myriad KOZAK MAMAI (a personage from puppet-theater Vertep, a Ukrainian equivalent of Commedia dell'Arte) pictures from the 1600's on, is a medium sized, round bodied instrument, with a rather wide neck, usually with frets, with necks longer than Kobuz's but shorter than Saz's, rarely resembling either the Kobuz or the Saz in general shape or body-neck ratio. The only resemblance that comes to mind is to the European MANDORA. (Interestingly, word BANDURA had been used in Ukraine as a semi-vulgar euphemism for feminine anatomy (and an outright vulgar term MANDA is still used in Russia, in spite of being considered archaic). One wonders about these terms' relationship to musical instruments Mandora and Pandora... The myth of Pandora and her Box also comes to mind and needs to be investigated). Around 1700 some Ukrainian Lutes-Kobzas have acquired a set of additional unfretted strings above the treble in a "psaltery" set-up. 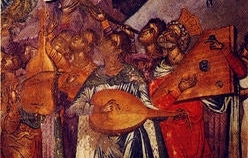 These instruments, which are only recorded in paintings without any surviving examples, are the TORBAN's immediate ancestors. The question whether this was a local development or an import from Italy remains (see the Illustation pages in Chapter III). 2) The fretted kobza with prystrunky. Important Note: In general, absence of frets on frettable instrument is not indicative of fretlessness, as historical instruments tend to lose their frets which were made of gut and TIED onto the necks, so the third item is under dispute. Some argue that in order to differentiate the kobza with the prystrunky from the kobza without prystrunky a new term was introduced in Ukraine. This was the word "bandura". This is not entirely convincing, as the classic 19th century Russian Dictionary by V.Dahl unequivocally states that the term "bandura" was applied not only to Kobza but to Torban as well. See the V.Dahl citation in Chapter V. And we can infer with considerable certainty that the word was imported from Southern Europe via Italy and Walachia. The historian Riegelmann differentiates between the two instruments and states that "in the (Ukrainian) towns they played the bandura, whilst in the villages they played the kobza." We suspect that Riegelmann might have been referring to Torban in using word Bandura. See the above, and the passage on Polish nomenclature below. 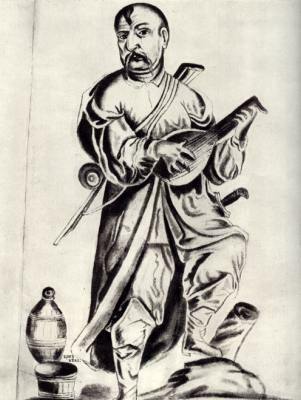 It should also be noted that the term TORBAN was used in Western Ukraine to denote ANY type of lute instrument as late as early 1900's, encompassing actual torbans, baroque lutes, mandoras and kobzas, even in literary descriptions of events set in Medieval times (see I.Franko's "Zahar Berkut" inappropriately using term TORBAN in spite of the author's awareness of an appropriate early kobza with only 4 strings). In Poland this instrument was known by the names kobza, lutnia or barduny and was very popular among the nobles ("Prince Samuel Koretzki brilliantly played kobza"), and has inspired many Polish poets in their creative fantasies". "Powiedrz wdzieczna kobza moja umie - li co duma twoja" (Czagrowski - late 16th cent. Polish poet). In Hungary koboz-kobza was known since 16th century, it existed among the Czechs, and in Romania it exists today. One of the first evidence of kobza being played in Ukraine are in the Polish 1584 Paprocki Chronicle: "Kozacy z wielkej radosci... spiewajac, na kobzach grajac" (Bartosz Paprocki. Herby rycerstwa polskiego. Krakow, 1584, c. 107). Though, in 17th century such a kobzar was called "kobeznik" (kobeznik - Zimorowicz. Sielanki. C. 147). Polish nomenclature differs from the Ukrainian in that KOBZA in Polish also denotes a Hurdy-Gurdy type of an instrument as well as a Lute, and it is unclear whether there was a definite linguistic difference between LUTNIA and BANDURA, although there is evidence that in Poland the word Kobza acquired a derogatory aspect and once possibly referred to a cruder instrument, in comparison to Lutnia and Pandura/Bandura. The latter term was seen as Latin in 17th century Poland. "...Nieladnie: ten Jmsc dobrze gra na kobzie. Ladniej z lacinska na bandurze...". (Some linguistic aspects of the nomenclature in Ukraine are discussed below). There are mentions of kobza-bandura used in the Polish royal Capella which date back to as early as 1325, and other sources mention a court bandurist in Kracow named Tarashko Rafal around 1441 (Lissa, Hominski, Swiezawski 1884). During the reign of Sigismund the Elder (1506-48) amongst the instrumental soloists at the court there was a Ukrainian Bandurist who was also the King's chess partner. There is another source, ca. 1500 that mentions another Ukrainian bandurist named Churylo (Hybynski & Polinski, 1907). 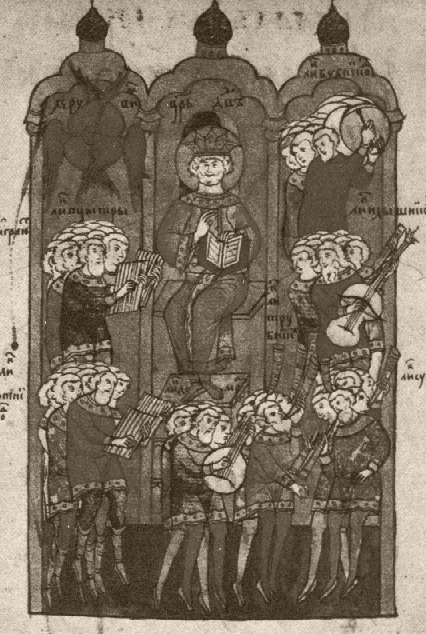 Some mediaeval Polish sources are open to dispute as there are several possibilities in interpretation of their Latin texts and the word SAMBUCA that occurs in them was known to denote many different instruments, and its assignment to Bandura by some researchers may be arbitrary. Some Pandorists traveled westward when the Elector of Saxony ascended the Polish throne in the 18th century: "zur fürstlichen Kapelle in Weißenfels gehörten zwei Pandoristen: "Joseph Doberzinsky, Kammer-Pandorist" & "Pantaleon Hebenstreit" (Werner 1911, S. 68, 71, 75f.) 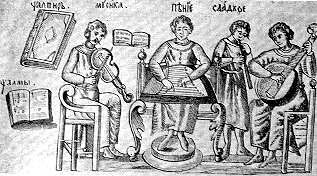 The latter was a colleague of lutenists Weiss and Gebel.... so we could infer that Lute and Kobza worlds did come into contact. Apart from those employed in the courts of Poland, after the treaty of Pereyaslav in 1654, bandurists became popular in the courts of the nobility and Tsars of Russia. Timofey Bilohradsky/Belogradsky was employed in the court of count Kaiserling and traveled in 1733 to Berlin where he gave concerts and took lessons from the renowned lutenist Sylvius Leopold Weiss (1686-1750) in Dresden (see Stählin). D.Tihomirov mentiones 2 "pandurists", members of Empress Katherine The Great court chapel: Lubystok and Nyzhevych, both Ukrainians. In 1731 the bandurist Hryhory Liubystok escaped from the court of Empress Elizabeth, but he was later apprehended in Ukraine and brought back. To entice him to stay he was awarded the patent of nobility with the honorary title of colonel. When kobza arrived in the aristocratic circles in Russia a boundary was drawn between a "plebeian" name "kobza" and a noble western word "bandora". This name was fixed in the Tzar's 1738 edict on establishing of a music school: In 1738 a special music school was set up in Ukraine in the then capital city of Glukhov/Ghlukhiv (then the Capital of Ukraine, now a small town in Chernyghiv province) to educate musicians for the Russian court. It was the first music school of its kind in Eastern Europe, and in its first year it had 20 people in attendance: 17 students, a conductor and 2 teachers instrumentalists - one to teach kobza-bandura, and the other to teach violin. 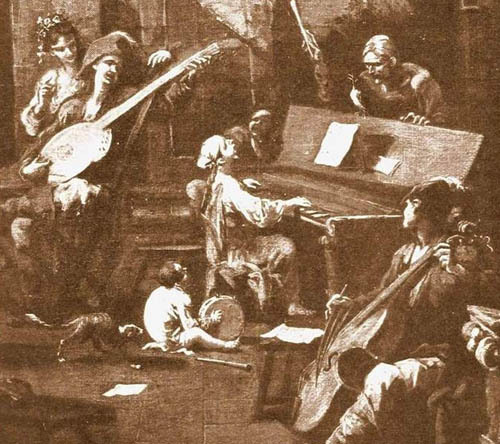 Ukraine exported musicians not only to the Court (the Imperial Capella was staffed largely by Ukrainians throughout the 18th Century) but to all gentry who could afford to keep a household musician. NOTE: the edict's source speaks of a written tradition rather than the oral of playing the bandura (i.e. the student were required to be taught how to read kobza-bandura music), but there is no tangible evidence of this that survives.